Request a New Student Enrollment Account if you do not have a Family Access Account and you are new to Marion County Public Schools. You will receive an email with your account information. If you have a student currently attending Marion County Public Schools and already have a Family Access account, New Student Online Enrollment is available as a tab in your current account. If you have forgotten your login name or password, a link on the login page will allow you to enter your email address and your credentials will be emailed to you. If you have not yet added your email address to your account, or if you changed your email address since you registered your account, you will need to contact one of your children's schools. If you have a student currently attending Marion County Public Schools but you have not registered your Family Access account, contact the school where your student is currently enrolled to get your account information. Please do not create a new account. 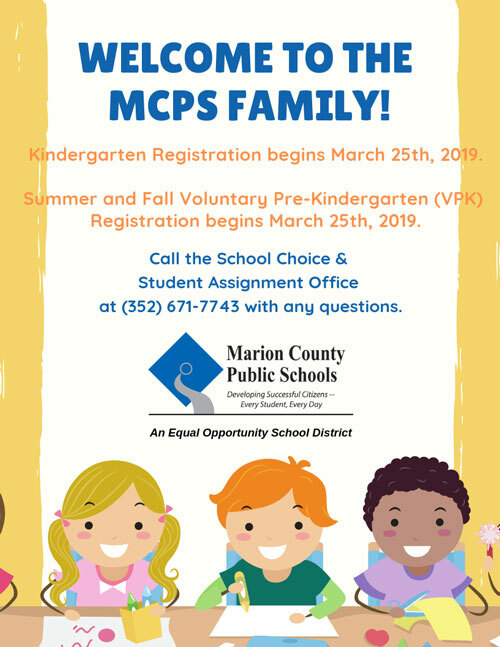 If your child is turning the age of five (5) on or before September 1 of this year, come register your child in a Marion County school. If your student was previously enrolled and attended a Marion County Public School, left the district, and is returning to a Marion County Public School you will NOT complete the New Student Online Enrollment process. You should complete the Returning Student Registration Application form and report to your zoned school with your photo ID and proof of residency. Contact the school for the best day/time to complete the registration process. See Forms section below for the Returning Student Registration Application.